The College of Education at the University of Montevallo recently honored a number of alumni at a dinner held in conjunction with homecoming activities on Feb. 6. At the annual dinner, the College of Education also one staff member for his or her excellence. 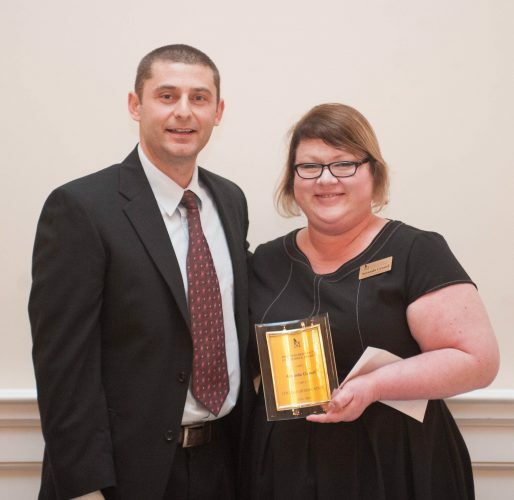 The Bill Fancher Staff Excellence Award was presented to Amanda Grauel of Randolph, Alabama. Grauel works as an administrative assistant for Family and Consumer Sciences (FCS) at UM. In this role, she is often the first person that students encounter in FCS. At the award ceremony, it was noted that the first impressions people gain of FCS are positive due to her helpfulness and thoughtfulness. Professor of Elementary Education Almir Smajic presents Amanda Grauel with the Bill Fancher Staff Excellence Award.